LOCATION.--Lat 40`50'10", long 79`06'37", Indiana County, Hydrologic Unit 05010006, on left bank 200 ft upstream from highway bridge at McCormick, 1 mi west of Georgeville, 1.7 mi upstream from Ross Run, and 4 mi southeast of Smicksburg. GAGE.--Water-stage recorder. Datum of gage is 1,164.88 ft above National Geodetic Vertical Datum of 1929 (U.S. Army Corps of Engineers bench mark). 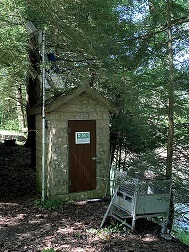 Prior to May 10, 1940, non-recording gage at site 200 ft upstream at same datum. Satellite telemetry at station.